When setting up our aquarium, I knew that we needed a basic thermometer of some sort to keep track of the water temperature in our tank. I had faint memories of my childhood setup, which was a floating thermometer, and hoped there was something better. 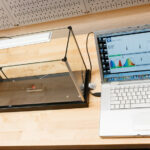 It turns out there is – a readily available digital thermometer for aquariums. Of the main options available for aquarium thermometers, I decided the digital route was desirable. A quick search on Amazon revealed several digital aquarium thermometers. I chose to purchase one by Coralife, model 00232 . As it turns out, the others that look similar are actually exactly the same. They all pop out of the same Chinese factory, but are branded and packaged by different companies. Rest assured, they are all exactly the same, in construction, quality, and accuracy. Other than Coralife, you can choose the HDE LCD Digital Aquarium Thermometer , or the ST-3 Aquarium Thermometer . A yellow HDE version is even available (with white wire and probe) if that’s your thing. Price varies a small bit, with the ST-3 generally being the cheapest, but they are all the same product. It is interesting that the different sellers have varying product satisfaction ratings on Amazon, with the Coralife being rated slightly lower than others. Again, they are all the same; I attribute the difference to the higher expectations of enthusiast who choose to purchase from the name brand of ‘Coralife’. The Coralife (and similar) digital aquarium thermometer is unique from other temperature measuring solutions in that it separates the probe that senses temperature from the display. 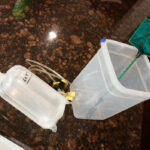 The probe and wire is waterproof and is to be placed inside the aquarium. 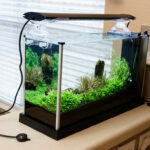 It comes with a suction cup that you can use to secure the wire/probe to glass inside the aquarium. The display unit is separate and you can place it anywhere you want. It also has a suction cup mount on the back to affix to a smooth surface. The display has a single line LCD that shows the temperature (to the nearest tenth of a degree) and the mode (celsius or fahrenheit). There are two controls on the display unit: a switch that selects the displayed units (either celsius or fahrenheit) and a power button. 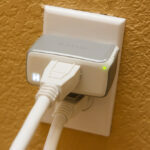 You hold the power button down for a few seconds to turn the unit off; a quick tap turns it back on. The display is very clear and easy to read. I measure the height of the numerals on the display at 8.7mm tall (0.34 inches). The display is not backlit, so you do have to have some ambient light to read it. The unit uses a single LR44 coin-cell battery. I have had the thermometer on for most of the year and the battery is still going strong. The long length of cord that separates the temperature probe from the display readout opens up many options for use. You can place the probe anywhere in your tank, secured by the provided suction cup. 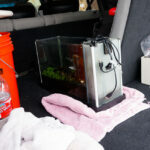 The cord can then be routed up and over the tank’s edge with the display mounted where you wish. You can put the display where it is readily visible, or you can hide it in an equipment cabinet. As an alternate, the probe does not have to be mounted in the actual display tank. 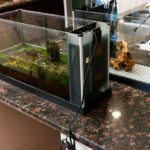 If you utilize a separate overflow section or sump, you can place the probe there and, if the water change rate is high enough, monitor the water temperature there and still get reasonably close to that of the display. I have observed this aquarium thermometer in use for almost a year, using it in conjunction with a STC-1000 in my DIY Temperature Controller. It is useful to compare results from the two as I consider the STC-1000 very accurate – it allows a calibration offset, meaning I set the offset for a 0.0ºC reading with the probe in ice water. Comparing the two units (calibrated STC-1000 vs. Coralife) the Coralife consistently reads 0.9ºC to 1.2ºC higher. The discrepancy could be considered concerning; however, the results were very consistent in tracking through a range of temperatures. This made me curious to check the calibration of the Coralife, so I made a ice bath and tested it. If you are not following, a prepared ice bath, with densely packed crushed ice in water, is 0.0ºC. Any temperature sensing device that is suitable for that range of temperatures, should read 0.0ºC and any deviation is considered the offset. My test showed the Coralife digital aquarium thermometer to read 1.3ºC, which confirmed the discrepancy when compared to the STC-1000. All of this to say that I would consider this type of digital aquarium thermometer accurate, but you should probably test vs. a known thermometer you trust, or test in an ice bath. A discrepancy will need to be accounted for. Given the focus of this website, it is worth praising the function of this format of thermometer (separated probe from display) and how it compliments the Fluval Spec Aquariums. The Spec’s all-in-one design, being very clean looking, does not benefit having an ugly thermometer hanging out in the display. For that matter, a temperature probe could still be distracting. This is easily avoided by mounting the temperature probe in the filter section, wedged between the filter block and the dividing wall of the overflow. Just push it down next to the filter so that it is fully submerged. The Spec aquariums have a flowrate high enough to ensure the water that flows through the filer section is an accurate representation of display section water temperature. By placing the probe in the filter section, it is completely hidden. You can then route the wire over the filter block and out the opening in the lid, with the other wires of the pump and heater (if you have one). The display can be mounted wherever. You can place it out of the way in a storage box, only viewing it when you feel the need to check. Or you can mount the display on the face of the outside glass. I didn’t feel like using the suction cup mount and instead decided to use some 3M double side tape to affix it to the side of the aquarium. I placed it low and in front of the filter section, so it is unobtrusive and does not directly block the display. The 3M tape is strong, but not too difficult to remove if you change your mind. I really like this model of digital aquarium thermometer. It is very accurate, certainly within the range suitable for fish keeping, and the ability to utilize a discrete probe and separate display lends to a clean look and many options for use. The price can’t hardly be beat. Even when compared to other traditional thermometers, like a floating thermometer or a stick-on, this digital unit comes in only a handful of dollars more. Price depends on the manufacturer you go with, but prices now range from $3 to $7 USD. If the configuration works for your aquarium, I can recommend it as a viable solution to your temperature monitoring needs. Even if you don’t use it as your regular aquarium thermometer, it is nice having one on hand to monitor water temperature for other hobby tasks, like checking temperature during water changes. This entry was posted in Product Reviews and tagged coralife, digital aquarium thermometer, digital thermometer, hde, lcd digital thermometer, st-3. Bookmark the permalink. I completely agree that an incorrectly prepared ice bath will actually be higher than 32F. It may be possible for an incorrectly prepared ice back to get as high as 36 degrees F; however, If you do it properly, the actual water temperature in the center of the ice bath will be very close to 32F. This video on how to make an ice bath (video at bottom of page) is very well done, informative, and one I can recommend. It gives the reasons ice water can read high and how to prevent this. hi, we are the manufacture of food thermometer, digital thermometer and hygrometer from China,we have specialized in this field for 20 years, welcome to contact us , i think this will be a good beginning between our business relationship.